If you have someone on your gift giving list that perhaps doesn't have children of their own but "fur children" instead, you might like to think of getting them the KatKabin. Or give your own cat a HOME for the Holidays. The KatKabin is a unique and innovative outdoor cat house that provides comfort, safety and shelter for cats. It is made from high grade materials designed to withstand all weather conditions and temperature extremes. 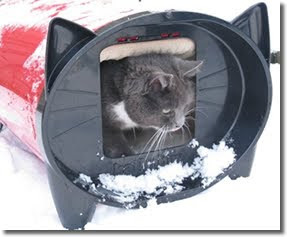 The Katkabin is insulated to provide a warm, dry place for cats and peace of mind for their owners. The optional, washable, fleecy Winter Warmer lines the internal body of the KatKabin to provide additional warmth, even in the coldest conditions - available separately or as part of the Premium Combination KatKabin. The KatKabin comes in a variety of colors as well. Kat Kabin is providing a discount code that is good for 20 % of any KatKabin product purchased on their website. It lasts until December 31, 2011. P.S Although we didn't use the Kat Kabin for cats, my daughter was quite excited to use it for her 3 ferrets. The folks at Kat Kabin would love to give away one of these kabins to one lucky winner from Canada or the USA. A random draw will be made by Random.org on November 20, 2011 from all entries received. Tell me if you have cats of your own or this would be a gift for someone else's cat. I have four cats of my own, so I would keep this! We've got three indoor kitties, as well as two outdoor cats. I've noticed a few more kittens around the neighborhood, so looks like one of the strays had a litter. This would be a great safe place for all those critters that I just can't catch. I have a one-year-old cat who LOVES sleeping in warm, soft, enclosed spaces. This would be great for her! We have two cats of our own who have just been relegated to the out of doors. When we no longer need it, it would go to my daughter's house. People keep dropping cats at her house and there are always about a dozen there. I am an email subscriber at the address below. I do cat rescue- 5 inside and a bunch outside (we always have 'visitors' when it is cold or they are hungry) I would keep it for them! We have a cat of our own, so he could use it, but I like the idea for my ferret, too. I have a kitten and just accepted a stray that kept coming to my door, so I could really use this prize! Thanks for the chance! My kitty Smokey would love this so we would keep it for us!